Weight watchers and those looking to have a better sugar control are always looking out for recipes that can help them move closer to their health goals. Hummus which is a middle eastern dish is full of goodness of fibre, proteins, calcium, MUFA (mono unsaturated fatty acids). The ingredients are easily available all round the year and easy to put together. In my opinion it is a favourable recipe for newbees in the world of cooking and anyone who needs healthy quick fixes for their meals. However, do take note that the most important thing, without which making hummus would be near to impossible is a blender. 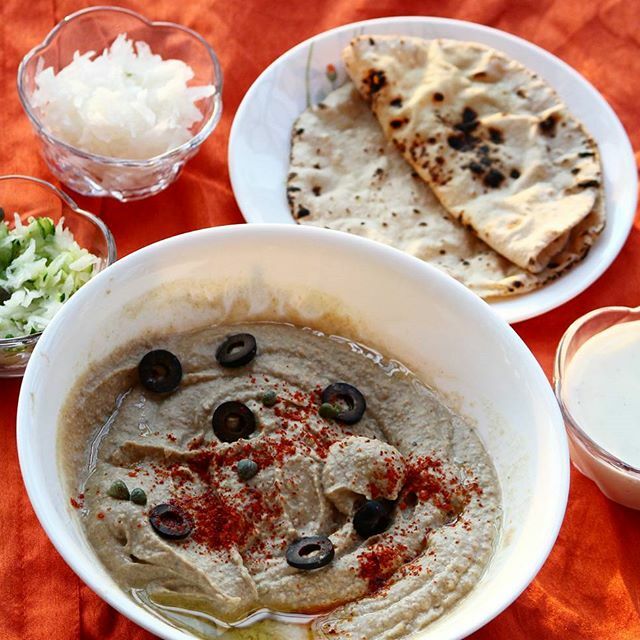 Below is the recipe of the classic hummus. Frankly, you can just play around the ingredients as per your liking of flavours. I tweaked mine a bit with the addition of peppercorns. I have skipped the classic accompaniment like falafels which are usually fried and mayonnaise has been replaced with slightly sweetened yogurt. Falafels can be baked as well which I will make sometime again and post the recipe seperately. They too are dense in protein and suitable for LCHF diet. The only requirement is a little extra time in hand. And very obviously as you can see in the image, there is no pita bread. I have replaced it with homemade Indian roti which helps to ditch the refined sugar, salt and oil which is otherwise present in pita bread. You can also use tortillas or vegetable fingers like carrot and cucumber sticks to go alongwith them. It’s very versatile and the flavours go well with any accompaniments. Peppercorns – 8 – 10 nos. Soak chickpeas/ garbanzo beans overnight in water. The water should be enough to drench all the chickpeas with 1″ above. Next morning, pressure cook them alongwith water and a pinch of salt. Alternatively, you may use canned garbanzo beans (though do not prefer much due to unecessary preservatives in there and rather cook). It may take around 20 mins on medium flame to cook well. While they are cooking, prepare the yogurt dressing by whisking the respective ingredients together. Prepare the filling of zucchini and half the amount of total grated radish by simply stir frying them in a pan with olive oil for 5 mins and salt. Keep the remaining radish raw for the extra crunch in your wrap. For the hummus, once the chickpeas are cooked, turn off the flame and let them cool. Take a high powered blender or a mixer grinder and put in all the ingredients. Ensure you add 2 cup of chickpeas water first and then add the chickpeas and rest of the ingredients. If there is any excess water left, strain and keep aside. It is highly nutritious and can be used for curries or cooking anything in the next meal. Take note to add only 2 tbsps of olive oil and the remaining 1 tbsp is used in the end to top the blended humus as a garnish alongwith the parsley. Sprinkle some red chilli powder on top and olives to add some colour to the neutral shade of hummus. Voila! the dish is ready. All you need to do is wrap it up.. hehe!